Key chains based on Rick and Morty! Assortment includes Rick Sanchez, Morty Smith, Snowball, and 5 other crazy characters. This 3-pack contains 3 randomly selected, blind-packaged key chains. Oh, look! Key chains based on the adult animated sci-fi sitcom Rick and Morty! Get your favorite Rick and Morty characters as Mystery Mini Plush Key Chains. The assortment includes Rick Sanchez, Morty Smith, Snowball, and 5 other crazy characters. Measuring approximately 2 1/2 to 3-inches tall, each plush comes in a blind bag so you can hunt and collect your favorites! 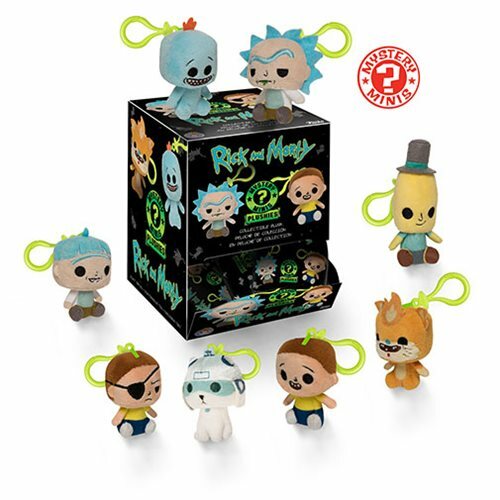 This Rick and Morty Mystery Minis Plush Key Chain Random 3-Pack contains 3 randomly selected, blind-packaged key chains: Breakdown not available at this time. Please note: Item selection is random. Items are in blind packaging. We cannot accept requests for specific items, nor can we accept returns on opened items. You may receive duplicates.